An artist of many talents. Tribal Belly Dance instructor, graphic designer, and painter. Born in Chilliwack, BC but having spent most of her life here in the Cariboo, Renée has been singing since a very young age and been on stage since elementary school. Her school operettas led to college choir, karaoke nights, and finally to singing and writing songs professionally with her current band, ThirdDegree. Renée has one CD out with ThirdDegree and is working on another for release some time next year. During Renée’s high school days she played many instruments including the saxophone, clarinet, flute, piano, guitar, and piccolo. Now Renée plays mostly the flute as well as the Zills, which are finger cymbals, and other small percussion instruments. Hand in hand with singing and all of her musical talents, Renée began belly dancing in 2006. These passions lead to Renée expanding her interests and finding a niche in Tribal Belly Dancing for which she has been teaching the last three years. Her group is called Twisted Skirts Tribal Belly Dance and meets once a week to practice and prepare for shows around BC. University led to an expansion in Renée’s talent, moving from pencil drawings and acrylic painting to digital graphic design. In 2002 Renée graduated from the Digital Art and Design program at UCC in Kamloops. From there she spent some time in Red Deer, Alberta before returning to the Cariboo. Renée has formed a career out of her graphic design talents and works full-time in the industry. Painting and drawing still play a part in Renée’s life as she takes her inspiration from nature. “It’s a way of looking at things,” Renée says of her artwork. “You can find beauty in anything if you look close enough.” It is the one thing that she wishes she had more time to do. Many of her art collections are representative of wildlife. Some of her acrylic work is more abstract and features colourful design that inspires the imagination and warms the heart. Renée has a playful side to accompany her art. 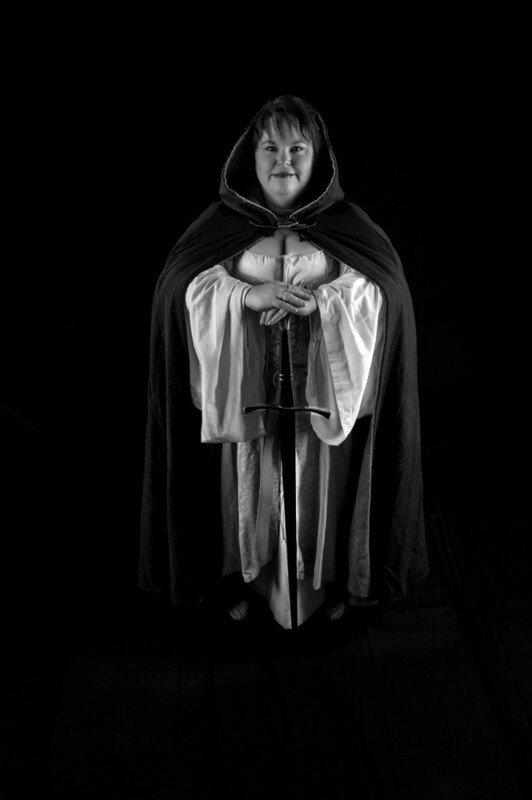 She is a member of the Society for Creative Anachronism (SCA), which does medieval era activities while in full costume. They take medieval classes such as Norse wire weaving, play medieval games, and have rapier and archery tournaments. She also participates in Heavy Combat Fighting that is done with full body armour and swords. Her Troubadour group sings and tells stories in medieval style. Renée says that it is not only fun but it also encompasses some of her other passions like belly dancing and costumes, appealing to her creative side. During Renée’s other leisure time she enjoys listening to live music and getting out to the local venues. “Quesnel seems to really support musicians and live music as there is always a band playing at one of the local venues every weekend,” Renée says of her upcoming weekend plans. As for the future, she plans to work on bringing more opportunity for musicians to be heard to the area. From performing arts and costumes to stage, singing to paint brushes, and even to her computer desk, this very talented artist will never be bored and will always know where to find inspiration for her art. From quiet and reflective art to bold and beautiful expression we have found a very multi talented artist for this month’s feature.